Looking for something extra fun to color holiday look? 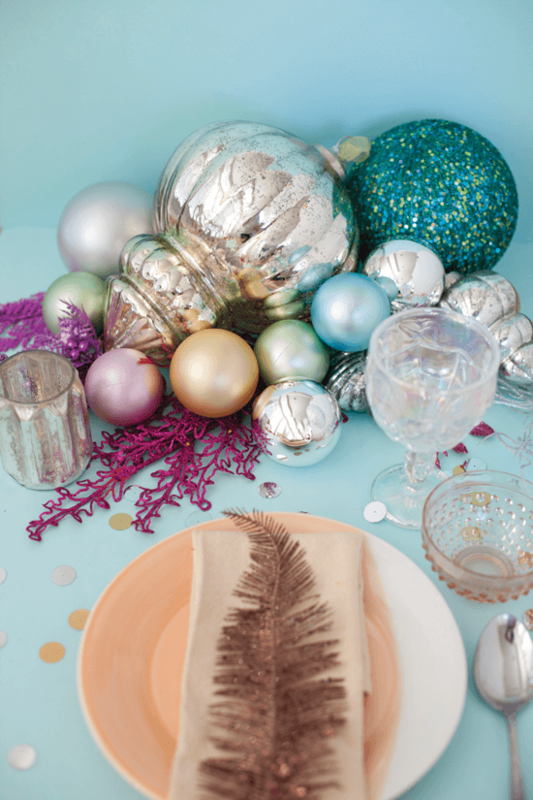 Try these fresh takes on Christmas décor with glitter, sequins and tinsel. If your idea of Christmas décor is more Sugar Plum Fairy than rustic red and green, then you know the magic that a little pink and shimmer bring to the season. We love a whimsical take on holiday decorating. And what’s not to love? Pastel shades and fanciful hues bring out the kid in everyone and seem to make everything feel just a little more festive. Here are four simple ways to add sparkling Christmas décor to your season with glitter, sequins and tinsel. Color is the foundation of this look, so pick your favorites in any color but the traditional ones. Here tiny bottlebrush trees come in an array of pastels. Even the green ones are a twist on the traditional hue thanks to their blue-green tint. Your centerpiece should be a treasure trove of shimmery gems. Here an oversized mercury-glass kugel forms the base of a cluster of shiny ornaments in sweet sorbet colors. Tuck in glittering holiday picks to soften the base, and be sure your dinnerware has luster of its own to boast. 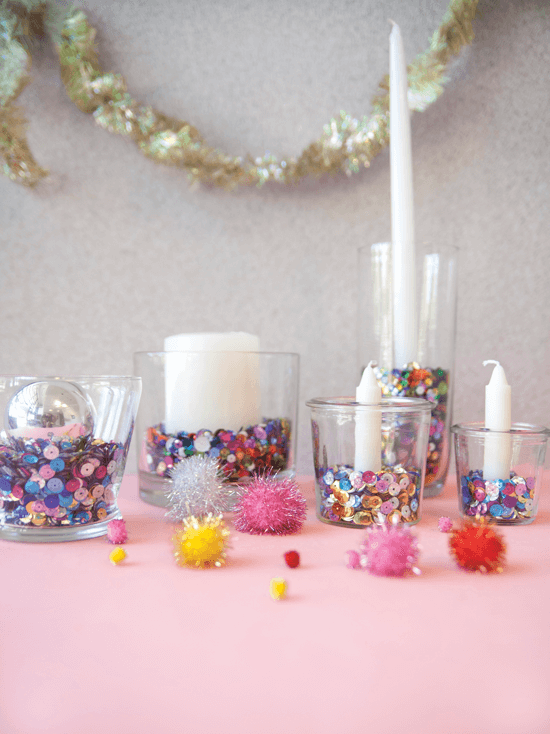 Sequins are a fun and easy way to update simple votives into a festive display—no sewing required. 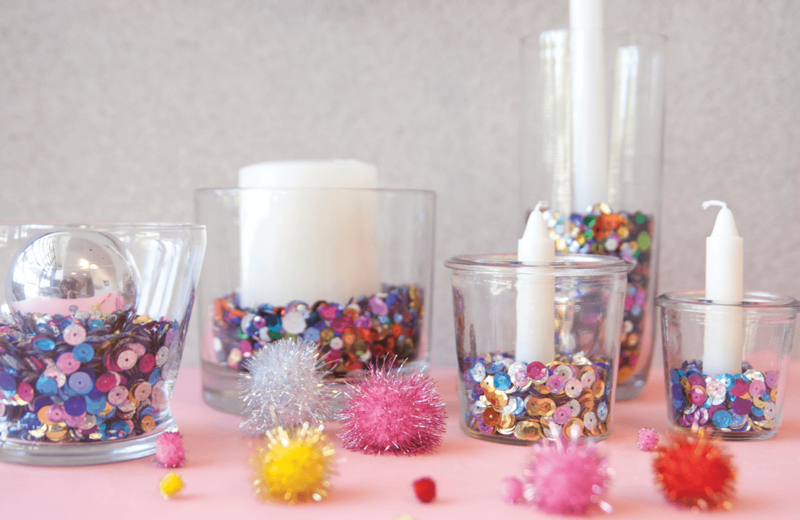 Simply fill the base of a glass votive, hurricane or even a clear glass tumbler with a few inches of mixed colored sequins—you can buy them by the bin at most craft stores. You can nestle candles into or atop the sequins, or fill each glass with a shiny ornament for a creative way to display your sparkling Christmas décor. 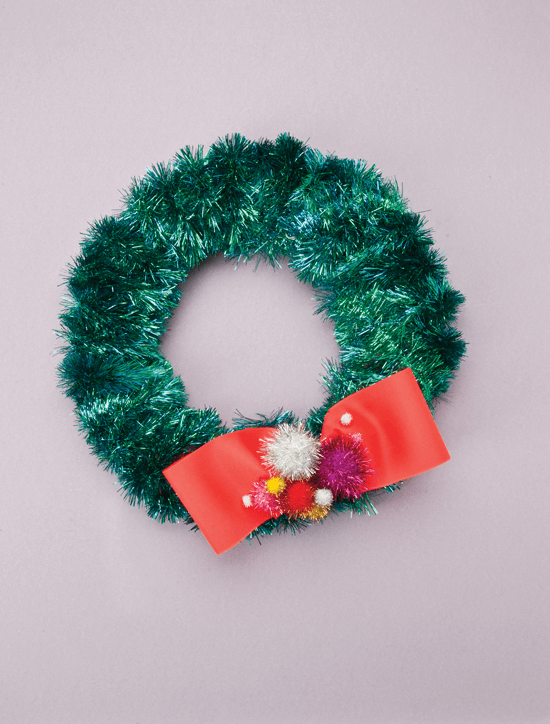 An iridescent green garland can easily wrap around a wreath form to create holiday dazzle. Just add a contrasting bow and a few flashy pom-poms to complete the fun and give your space a touch of sparkling Christmas décor. 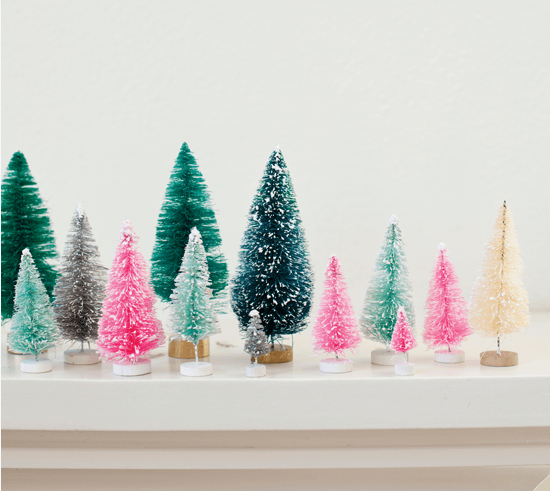 Looking for more colorful Christmas decorating ideas? Check out this tour of A lakeside home in New England that get’s in color inspiration from the water.